Not that I need another project!! Oh!!! It finally arrived!! Talk about speedy delivery!! A couple of years ago when I was at The Ellie Sienkiewicz Applique Academy, a student showed her stunning version of The Civil War Bride Quilt at Show and Tell. You can imagine the ooohhs and aahhhs from the audience! It has been on my radar ever since I saw it. Thank goodness for the internet! I happened upon the pattern on Threadbare’s website. Needless to say, the check was in the mail and I have been (im)patiently waiting by the mailbox. Now the fun begins!! I am now auditioning fabrics and backgrounds!! This is such a good way to spend an afternoon! Of course, I am still stitching away on Friends of Baltimore. It’s amazes me how much I get done when I actually sit down and stitch. Sometimes I can’t sit down because my chair is occupied!! I had to come check out your blog after I found your (very nice) comment on mine! Your work is incredible. Love what you do! Thank you so much! 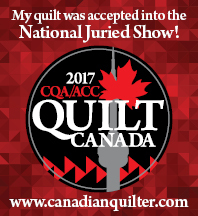 Quilting keeps me sane!! Oh good questions!! I am pulling from my stash, which is sometimes a challenge. I have lots (lots!!) of bright fabrics, but I am trying really hard to use duller fabrics to give this quilt a certain look. For the past couple of years, my fabric tastes have been changing and I seem to be leaning toward civil war type fabrics. One of the comments I have about using fat quarters for applique is this…its a lot of fabric! You will probably do a lot of repeating….which is ok! Applique takes very little fabric, so I tend to look for fat eights or even charm packs (5″ squares) or layer cakes (10″) squares. Your fat quarter bundle will probably work, you may just have to add lots of tone-on-tones for variety ie. green for the leaves and stems. Good luck and have fun!